The Broadback River in northern Quebec, Canada drains into Rupert Bay (a smaller bay at the south end of James Bay), just south of the Rupert River and Cree community Waskaganish. The Broadback River offers the opportunity to experience an extraordinary wilderness whitewater trips; it is little known and little traveled. Filled with impressive rapids, the Broadback flows from lake Trovlus, through Lake Quénomisca and Evans area, and finally into James Bay, near the Cree village of Waskaganish. Waskaganish, also known as Fort Rupert, was the first trading post built by Pierre-Esprit Radisson et Médart Chouart, sieur Des Groseillers in 1668. The Cree people call this river “Chistamiskau Sipi” or deep river and “Matauchun Sipi”, river where water goes in different directions. 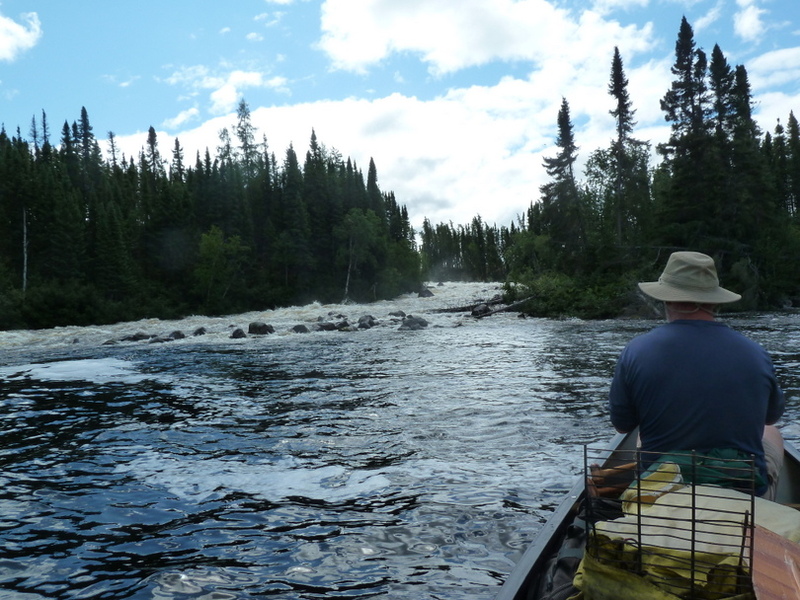 It flows through a magnificent landscape in Quebec’s northern Taïga forest. The Broadback’s length is 450 kilometers or 280 miles and its watershed is nearly 21 thousand square kilometers. It was formed upon removal of the Tyrrell Sea, an epicontinental seas occurred during deglaciation. Historically, the region of Broadback is occupied by the Cree Indian who hunt and fish for game fish. In the late 1980s, archaeologists David Denton and James Chism found in some areas adjacent to the river indicating a presence of traces of prehistoric occupation of the premises. During the nineteenth century, the Bay Company Hudson is built fur trading posts. 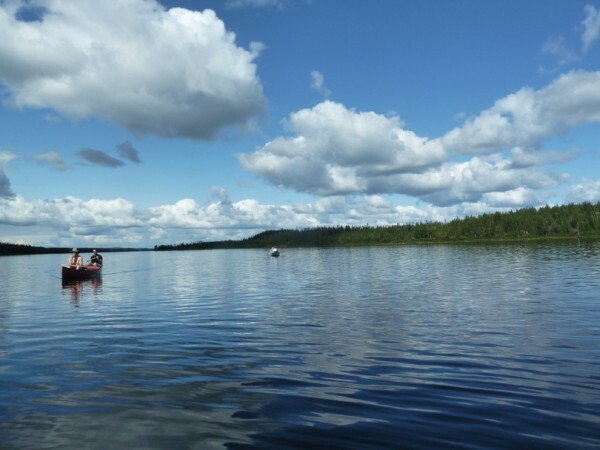 In 1972, the Broadback was chosen to be part of a large hydropower project, however, it was anticipated that the creation of several large reservoirs have biophysical and social impacts for the Cree communities of Mistissini, Waskaganish and Waswanipi. So, after long negotiations, an agreement was signed in February 2002 on establishing a new relationship between the Government of Québec and the Crees. The draft Nottaway-Broadback Rupert was finally abandoned. The Broadback is the scene of regular fires that regularly decimate hundreds of square kilometers of forest. Saturday. We left our house at 7am as temperatures were projected in the mid-90s and Skip’s Subaru Forester had no AC. We took a route across the ADK Park intersection 81N near Frontier Town and drove towards Montreal. We ate lunch at McDonalds where we had 2 $1 McDoubles, filled the car with gas and changed drivers. Skip’s clutch is ‘touchy’ and I stalled the care three times getting out of the parking lot and once while pulling up to the customs agent. We had a short quick line at customs and the customs agent warned us that we were a long drive from Chibougamau. I drove for two hours and swapped back with Skip. After a few Tom-Tom GPS errors we found our gas station/restaurant/motel destination at 6pm. Québec briefly tried to establish French as its sole language with the Charter of the French language. All signage and menus are in French and the initial response of all service workers is to speak French. Therefore, my menu choices were largely limited to foods I could recognize. I had spaghetti and a Caesar salad for dinner ($37). Food portions were adequate, but distinctly smaller than USA. Skip & I read for a while and turned in around 9:30pm. I heard the Blain family arrive sometime around midnight, but slept great and awoke at 6am. Sunday. Awake at 6am, we showered, had a western omelet breakfast and afterwards met up with the Blains who were just arising and headed to breakfast. There was a light rain all morning long as Skip and I left and headed on to Chibougamau where we picked up beer at MAXI’s drove around town and had lunch (fish and chips). We met up with the rest of the group who had completed grocery shopping. We filled gas tanks of all four cars and drove to the ranger’s station to complete our permit process. 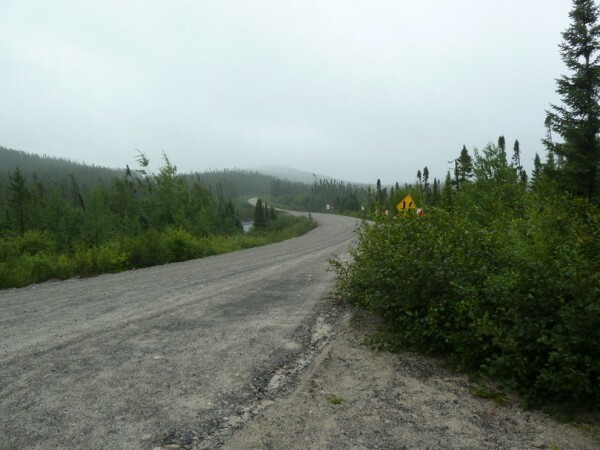 We drove out Road du Nord 107km from Chibougamau. There was evidence of many recent forest fires around, especially around Lac Frotet. At 107km we found the road to Mine Troïlus and drove on it for 26 km until the bridge that was our put-in location. The bridge is over some shallow rapids. The put-in was just after the bridge on the east side at Km 491 on the road to the gold mine in Troilus. 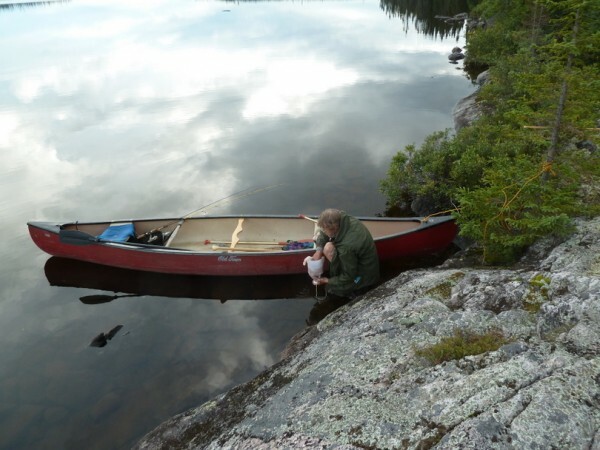 We unloaded the canoes down a steep bank and after much searching and deliberation we made camp at the intersection of a logging road and the main dirt road. We no sooner got our tents up than it started to rain hard. 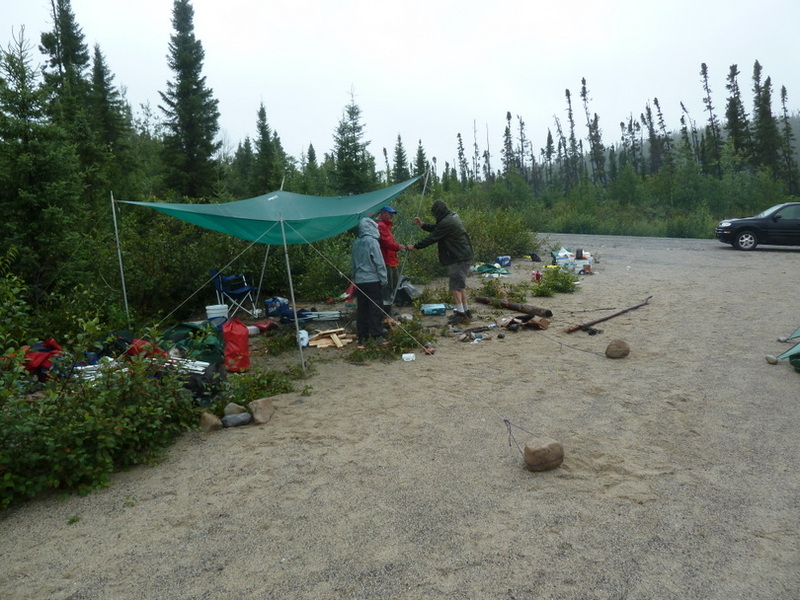 Our tarp setup wasn’t great, but it helped as Carol, Ken, Patrick, Suzanne and I stayed in camp while the others shuttled cars to the take out location ~1 hour away. It rained so hard that we had to start our fire under the tarp. It rained so hard that the runoff came down the main dirt road and ran under the ‘guys tent’ that was located closest to the intersection of the logging road and dirt road. After an hour we moved our fire outside the tarp. We estimated the return time of the group and cooked spaghetti and broccoli for dinner. The group returned dry and drunk from their shuttle drive – especially Bill. Ken’s SUV had a flat tire so they used the air pump located in the SUV to pump it up – hoping it would still be filled in the morning. Ken cooked 4lbs of spaghetti which was at least 1/3 more than we needed. During our after dinner discussion I relayed that I had recently read that the Lewis and Clarke Expedition had only cooked one meal – dinner. Breakfast and lunch were composed of the leftovers. Thus we adopted the practice of saving dinner leftovers for a“Lewis and Clarke Lunch”. After dinner it started to rain hard again. I helped wash dishes and headed into the tent shared by Skip and I. At least ours was dry, the combination of good tent design and a fortunate pitch location. Monday. During the night it was very windy. The tarps were blown down, unsecured items scattered and some tents had windblown rain come up under the tent fly. Ken started a fire, made cowboy coffee and cooked steel cut oatmeal. While Ken cooked Michael and Ed changed the flat tire on Ken’s SUV. It was 52 degrees with wind and rain – rather cold standing around. We finally got organized and launched by 11am. It was windy coming across the lake. Thankfully, Skip had found some detailed maps from Lester Kovac on the internet (https://sites.google.com/site/landltrips/Trips/Broadback2005) which were used by Patrick. We did several rapids either running them and/or lining them. During our lunch break Skip gave me some vegetable chips which Kathryn had passed to him the morning of our departure in recognition of our wedding anniversary. We did 12 miles and finally stopped to camp near a boat that was stored water side spotted by Skip and I. There was a road and a large cleared area. There were lots and lots of blueberries alongside the graded road. We believe the road was made to provide access to the boat and subsequent fishing on the river/lakes. I took a swim and washed up in the lake. We had a late dinner. We ate blueberries as a snack. Tuesday. Ken, Skip and I were usually the 1st to arise and as Ken made cowboy coffee Skip and I picked blueberries for our pancake breakfast. People were slow to arise and get around this morning and we barely were on the water by noon. 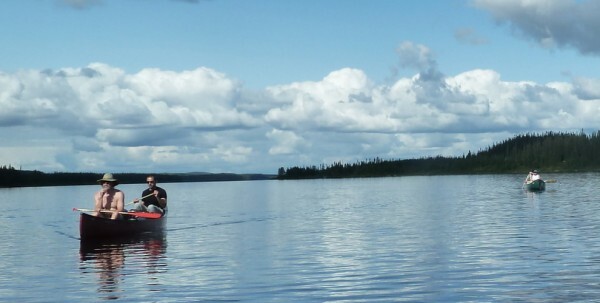 It was a short day of flatwater paddling with only the challenge of wind. We paddled to a sandy beach where we went swimming and washed up. Ken and Ed stopped off at a known ‘honey-hole’ to fish for walleye and they showed up with 13 nice sized fish for dinner. Skip and I check out an alternative site on a large rock. 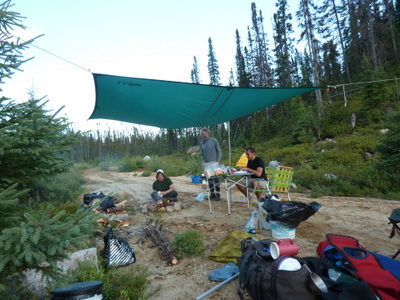 Upon our return to the group we decided to proceed to the new location as it provided more tent space. Contrary to campsites in the ADKS most campsites along the Broadback were in beach areas. There is not enough camping traffic to keep sites located in the brush cleared of trees and brush. 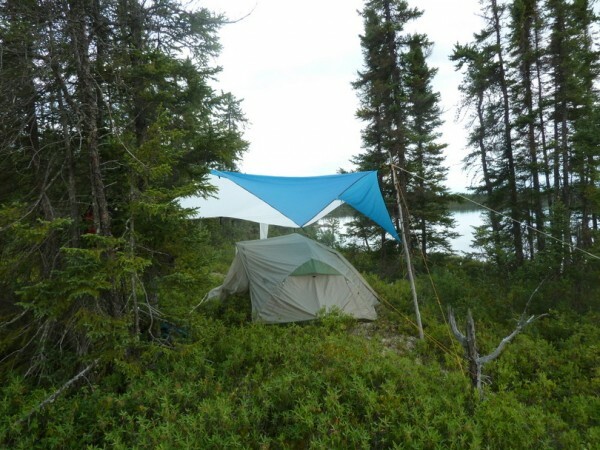 Some ‘cleared’ areas entailed pitching one’s tent on the Labrador tea shrubs – a type of rhododendron used to growing in peat, and mossy lichen tundras. As the group canoed to the new location it threatened rain and I managed to get a tarp up just in time to help avoid a short thunderstorm. Black flies were biting as we disturbed the brush so we sprayed repellent and changed into dry pants, socks and shoes. This campsite was a combination of rocky outcrops and brushy areas. 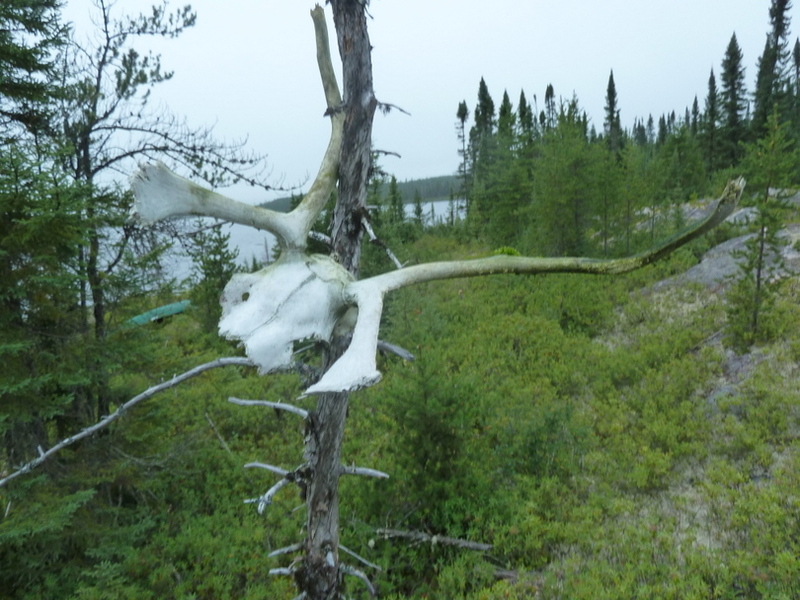 There was an old woods caribou skull and remnants of boughs laid down for winter camping tent. I pitched a 2nd tarp over our tent as I was fearful of more rain overnight, but it wasn’t needed. Ken cleaned all the fish. Dinner was at 7pm and consisted of rice, cucumber salad and walleye fry that was fantastic. I ate too many walleye, but they were so good. There was much debate over what time to get up and depart the next day as we had 22km to paddle with lots of lake paddling, several R1 and R2 rapids and one R4 that we would have to line or portage. With the higher than normal water levels we weren’t sure if the R2s would require lining or be runnable and if we would lose time if people dumped. Finally, Ken declared 6am as the ‘wake-up’ time, which is the time Skip and I had been arising. Wednesday. We were up at 6am and packed our tent and gear. Ken skipped a fire and made coffee using his Coleman Primus stove. We ate granola cereal and we were on the water by 8:30am. In the interest of keeping everyone together Bill re-arranged paddling combinations: Skip went with Patrick and I paddled with Bill. Skip overwhelmed Patrick with his pace and Patrick spent a lot of time checking the map, by at least this kept the group together. Bill and I came very close to dumping twice during the day. Once when we tried to go cross current and got hung up on a large log strainer and once when we got hung up on a rock. We ran all the R1 and R2 rapids (roughly 12 rapids in all) and lined/hauled boats along the shoreline through the R4 rapid. Other boats had some close encounters. Only Skip went for a total swim and he and Patrick got caught and Skip made the decision to swim rather than pull the boat over. We got to the Coné Falls campsite at 3:30pm having completed 23km. The waterfall camp had not seen much use. There was still a woodpile left by the Blains from their last trip down the Broadback five years ago. The waterfall was loud. Michael, Patrick and Ed set their tent up right on the edge of the falls while the rest of us opted for more distance. Thursday. We awoke to a clear sunny morning. I sat in my chair and performed a repair by super-gluing my toe nail back onto my right large toe as it was separating and I was concerned of a tear. I wore my crocs thinking they would dry out during the day – which they did. However, my foot would slide around inside the croc when I was walking or climbing on rocks as we lined boats around obstacles. Lesson learned: Next trip use my water shoes and keep the crocs as camp shoes. Skip started a fire and I packed up our tent. Skip and I offered to take all the heavy gear (chair bag, cooking pots, etc.) in our boat. We had several R1 and R2 rapids and lots of lake paddling to finish up the day. We had very nice temperatures. We had a 300-500 yard portage around the Carcajou Chute and hit our lake paddle with virtually no wind. Our typical lunch break consisted of finding a rocky shoreline where we could extract ourselves from the boats for a while. Lunch food was stored in a plastic bag inside a 5 gallon bucket with a lid. The whole bucket was retrieval and combined with the Lewis and Clarke leftovers for lunch – some of which were admittedly better tasting than others. Patrick and Suzy made the decision to paddle all the way out to the take out so that Suzy could return in time to participate in a pre-wedding party and Patrick wanted to get to a phone to check on his family. 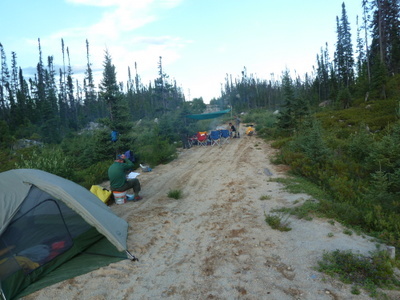 We had problems finding a suitable campsite for the group and ended up only a short distance from the take-out. Ken saw a recent track from a small bear in the sand where we landed. Friday. Skip and I slept late. We had intended to arise early, paddle to the take-out, retrieve the shuttle car at the put-in and be on our way. Instead we slept until 7:30 and had coffee with Ken, Carol and Bill before departure. At the take-out location, a bridge at HWY 113 at Km 376.3, I took a quick swim, washed up and changed into clean clothes. We loaded our canoe and gear into Skip’s Forester and headed out to retrieve Ken’s SUV from the put-in. We cruised along at 55 mph on the gravel road. Part way there Skip expressed concern if he would have enough fuel left to return to Chibougamua once we had completed the shuttle. Upon reaching the put-in we checked to ensure Ken’s replacement tire was still good – it was. Skip detected the smell of oil and so we checked the dip stick which was dry. Looking under the engine we saw a pool of oil and a small stream emanating from the oil pan. We surmised that our speed caused a stone to be thrown up against the oil pan and causing a leak. We extracted day packs and food from Skip’s car and returned to the group at the take out to share the news noting on the way the low fuel situation in Ken’s SUV. 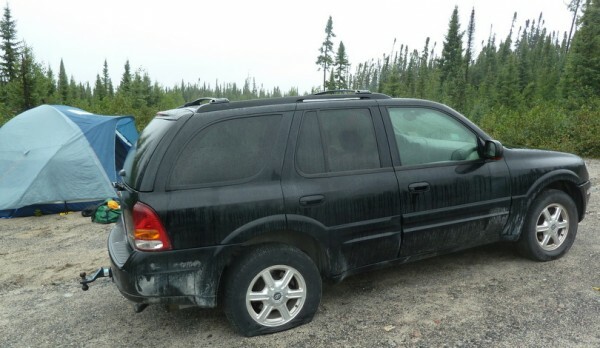 Our plan was to extract ourselves to Chibougamau where Skip could get cell phone coverage, contact AAA and arrange for a tow truck to come in the 120km and retrieve the car for repair. Fortunately Skip had recently upgraded his AAA coverage to include a 100 mile towing range. Riding out in Ken’s SUV we closely monitored the fuel and estimated our drop dead location based on the SUV’s calculated range. Ken drove a steady 35mph to enhance our range. Once the low fuel warning set off the car’s computer no longer provided range information. Our hopeful goal was to reach the ranger’s station located 107km from the turn off to the put-in. At the ranger’s station Skip was able to secure phone numbers of two towing garages while Ken and I debated the use of Coleman’s fuel to supplement remaining fuel in Ken’s SUV. We dumped in about 12oz of Coleman’s fuel and set out for Chibougamau. 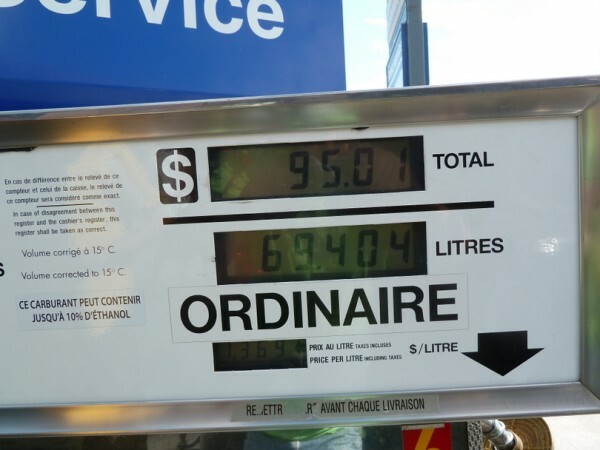 Those following us detected white exhaust plumes but we experienced no problems and managed to reach Chibougamau and a gas station where we pumped 18.33 gallons of fuel into an 18.7 gallon fuel tank. Skip departed the group to ride with the tow truck and direct him to the Forester. The repair shop would not be looking at Skip’s car until Monday AM so I took a ride back to Albany with Ken and the Blain’s. Friday night we made it as far south as La Tuque. At 11pm the others went looking for a bite to eat while I crashed. Saturday. We met at 9am for breakfast and were on the road at 10:30am. We stopped in Montreal for lunch, smoked meats and bagels. 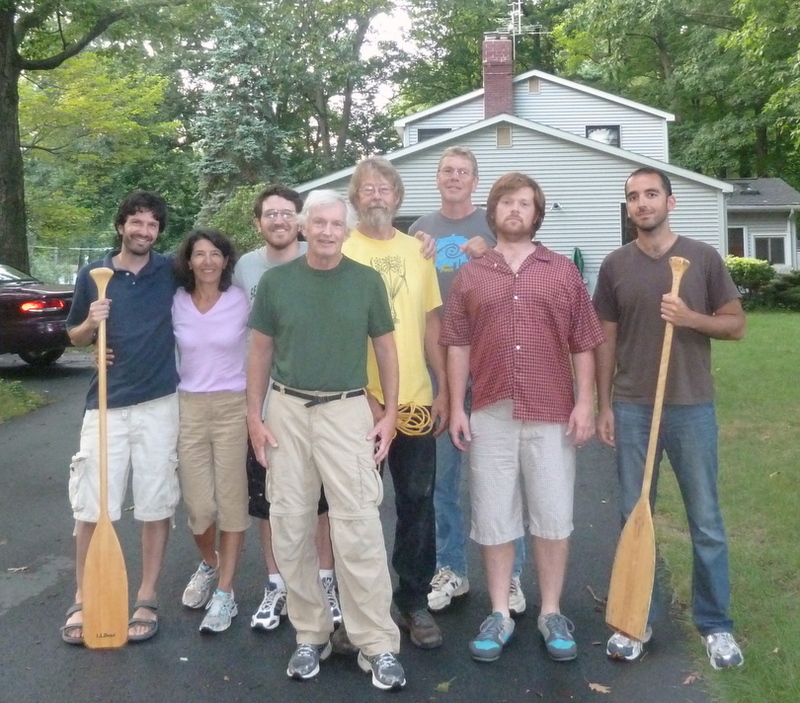 We reached Clifton Park at 7pm where we quickly unloaded a canoe and sorted out gear. Ken took me to the Pattersonville Rest Area on the Thruway where Kathryn retrieved me at 9pm for my return home. The punctured oil pan kept Skip in Chibougamau for five additional days during which we exchanged occasional emails. I sent Skip this rendition of “I Could Have Danced All Night” from My Fair Lady. Skip’s new oil pan which was delivered and installed on Wednesday AM. Skip drove through the night (763 miles) arriving home 6am on Thursday. Skip dropped off my canoe and camping gear at 4pm on Thursday. I spread the damp tent and tarps out on the deck to dry and threw all my camp clothes, worn or unworn, into the wash.
Michael, Carol, Max, Bill, Ken, Jim, Patrick, Ed. Missing from picture: Suzanne and Chibougamau Skip.